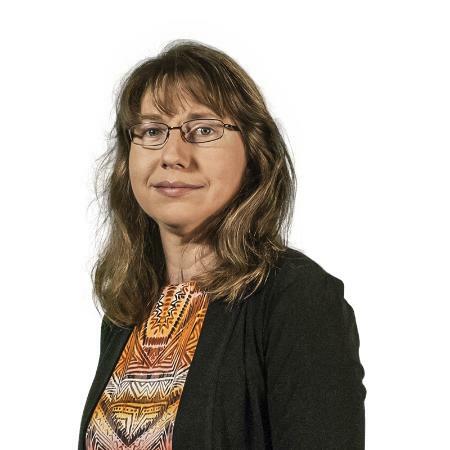 Linda Cronk is a communications specialist for Iowa State University’s Environmental Health and Safety division, which provides training for employees and students, plus an outreach program providing training to private companies. A Certified Professional in Learning & Performance (CPLP) and a Certified Associate in Project Management (CAPM), Cronk supports the learning management system, which involves project management for feature custom development, technical and customer care support, designing and assigning permissions, and providing training on those permissions. She holds a master’s in industrial and agricultural technology from Iowa State University. What do you love most about being a learning & development professional? I wear a lot of hats (officially and unofficially) within my organization, but through it all, if I can help others, make learning easier and more enjoyable... that’s the rewarding part of what I do. I try to see the big picture, to see the connections and how my role relates to the overall goal or mission of the project, collaboration, etc. What advice do you have for aspiring L&D professionals? Do not be afraid to try something new or to take on a new role. You never know where the journey will lead. I have built so many positive relationships because of one pivotal moment and each opportunity along the way. There is one pivotal moment that when I think back, it was most impactful on my career. Six years ago, I was placed in the role of technical management of our learning management system to work with the developer supporting the system. Although the role was small at the time, it has grown greatly and has provided me with so many opportunities to grow in areas of employee engagement, working in a team environment, consulting to discover needs, and then being able to meet those needs. What advice do you have for learning project managers? Define the scope of the project up front, along with resources, budget, and time constraints. Many times, a sponsor wants a training to have all sorts of “engagement” for which budget and time constraints will not allow, or the subject matter expert has a hard time distinguishing between the information the SME wants to deliver in the content versus what the learner really needs for training to be effective. Defining all of this early in the development process can ease the pain of the review process later and save on time and money. What are some challenges you have faced as an LMS administrator? Out of all my experience, there have been many lessons learned—most of which have communication in common. Keeping key people informed on the performance of the system is important. In an organization the size of a public university, this is certainly a challenge. Another challenge that comes to mind is navigating change. As our system moved from use by just my immediate department for delivery of training content to a university-wide shared system used by many departments, the dynamics of communication, system support, and importance of certain stakeholders changed. At this same time, our central IT services also underwent a change. All these changes were for the better. The overall impact on how I did my job shifted my emphasis from supporting just my immediate coworkers to supporting several departments. If I had not been open to change, I would not be where I am right now. How does your organization use eLearning? We use eLearning extensively for employee and student training that is mostly regulatory or compliance-driven. It is one of the easiest ways to reach a larger audience. One of my biggest struggles is defining exactly what it is that constitutes eLearning, and striking the balance of delivering content in a way that encourages learning without overdoing media richness and use of interactions. Sometimes, keeping it simple is the best way to go. We have had great success with online learning. I work on training collaborations with departments within the College of Engineering. One of my biggest successes has been mentoring students on training development and watching them produce learning modules used by their peers that help everyone be safer in the academic shops and labs. It is one of the more rewarding parts of my job. Tell us about a training initiative that improved a group’s performance. My office collaborated with the College of Engineering about five years ago to develop a way for academics to easily incorporate safety training into the academic curricula when it comes to student use of shops and labs. A manager training needs tool was developed out of this collaboration. It allows me to create a listing of learning modules hosted in our LMS that is accessible to instructors to assign to students through the academic LMS. When students complete the learning modules, it is recorded in the grade center of the academic LMS. It completes this connection between transfer of grades and access to safety information, but it also starts conversations about the importance of working safely, no matter whether someone is an employee, student, or visitor. The use of this application has certainly made it easier for many. Students do not have to print or submit paper copies of completion certificates. Teaching assistants no longer have to manually enter grades. Instructors have access to material to enhance their curricula and to expose students to a culture of safety. How have your credentials boosted your career? My CAPM (Certified Associate in Project Management) and CPLP (Certified Professional in Learning and Performance) certifications mean a lot to me. I worked hard to achieve them and am proud of my efforts. Because I achieved them after gaining experience, I feel the credentials indicate my level of experience and help communicate my capability to others. The more I network outside of my place of employment and with other departments within Iowa State University, the more I notice the recognition that comes along with having earned my credentials. There is an advantage to earning the credentials.